The Cape Cod Chapter of the National Railway Historical Society is a non-profit 501c3 organization dedicated to the promotion of and preservation of railroad transportation history, with special emphasis on Cape Cod railroading. The Chapter was chartered in 1986, although the Cape Cod group can trace its history back to the early 1960s. Museum is open May-October Saturdays 9:00 a.m. to 2:00 p.m. The Cape Cod Chapter of the NRHS supports railroad historians, collectors and enthusiasts on Cape Cod. 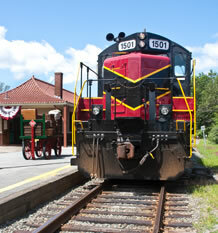 Donate to Cape Cod Chapter, National Railway Historical Society, Click Here!